So says the Earl of Rochester (Dominic Cooper), in the play’s opening lines, breaking the fourth wall before the audience has a chance to settle. The speech that follows is self-deprecating, gloriously obscene and, most importantly, characterised by a confident and perceptive rhetoric that speaks of Rochester’s reputation as one of the most talented satirists of his age. Yet whilst we are undoubtedly not meant to like Rochester, or have any desire to emulate him, he remains a rather unsatisfactory character – a plausible and, at times, charming addict, but also predictable and oddly dispassionate. We gain an early insight into Rochester’s character through his closest companions, introduced as they seek to identify the “good bits” and “bad bits” of a work of Dryden, then Poet Laureate. Between George Etherege (Mark Hadfield), Charles Sackville (Richard Teverson) and Billy Downs (Will Merrick), the poet, the aristocrat, and the ‘young spark’ are represented, whilst his favourite prostitute, Jane (Nina Toussaint-White), speaks for herself. In turn, his relationship with Charles II (Jasper Britton), whom the programme notes describe as treating him like “a surrogate son” whom he frequently had to expel from court for “bad behaviour”, beautifully illustrates the intriguing, dangerous manner with which Rochester conducted himself in court. It is an indulgent and spontaneous existence, which offers Rochester a paradoxical stability – it is wholly expected of him and he has both the impetus and the charm to carry it off. This is only challenged when he sees Elizabeth Barry (Ophelia Lovibond) at the playhouse, and she awakens new love in him. Her much derided performance speaks to him of some deep truth, and he becomes her acting tutor, in an attempt to play out his passions. There is a lot to like about Cooper’s performance. His Rochester is a witty and energetic leader of his ‘merry gang’, and his barbs with Jasper Britton’s gloriously flamboyant Charles II are a perpetual highlight. He also delivers a number of quite brilliant monologues and asides which gratify Rochester’s ‘love of language’ – a phrase that was heavily critiqued in Alan Bennett’s The History Boys, yet seems apt here, due to abundance and indulgence with which it is exhibited. Nevertheless, Rochester’s relationships with the women in his life are oddly lacklustre, lacking complexity and consistent passions. We hear much of Rochester’s double life; when he is in the country, with his wife Elizabeth (Alice Bailey Johnson), he is a retiring family man, in stark contrast to the Libertine who stalks London. 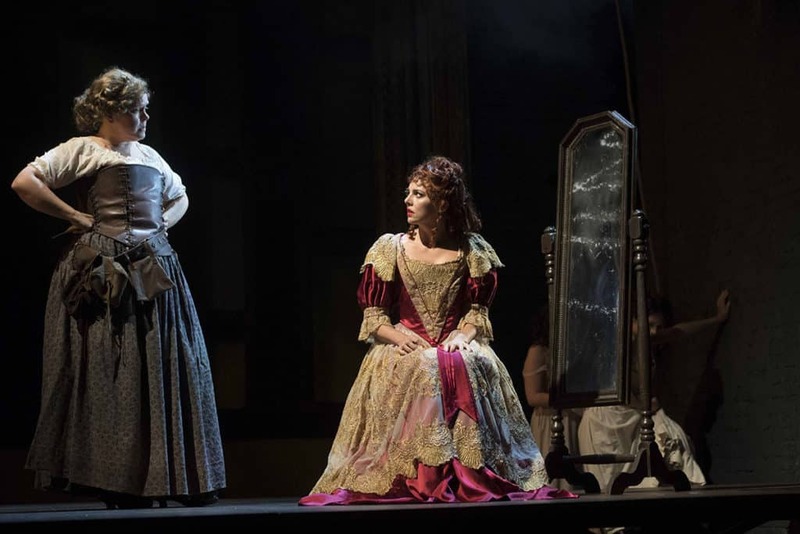 Yet Rochester’s ‘romantic’ traits, which Elizabeth speaks of with longing and regret, are merely informed – on stage, their interactions follow the same desperate pattern. She keeps pleading with him to be compassionate towards her, and he treats her with indifference. In turn, Elizabeth Barry is an unsatisfactory foil. Lovibond gives a good performance, capturing both the extraordinary frustrations of her profession, and her righteous anger at Rochester’s self-involvement – which plays a key part in the denouement. Yet their passions seem to be fuelled by little more than curiosity of an introspective, rather than empathetic sort, which does nothing to prevent Rochester’s speedy downfall. This gives their affair a sense of purposelessness which, whilst wholly consistent with Rochester’s behaviour and world view, does little to distinguish it, and make his end the more tragic. The Libertine contains a host of excellent supporting performances. Nina Toussaint-White’s Jane offers a stark, and at times very moving depiction of the unsettled, unsettling life of the 17th Century prostitute. Hadfield, Teverson and Merrick are a riotous trio, and their pursuit of Bacchian pleasures is both compelling and pathetic – an effective critique. 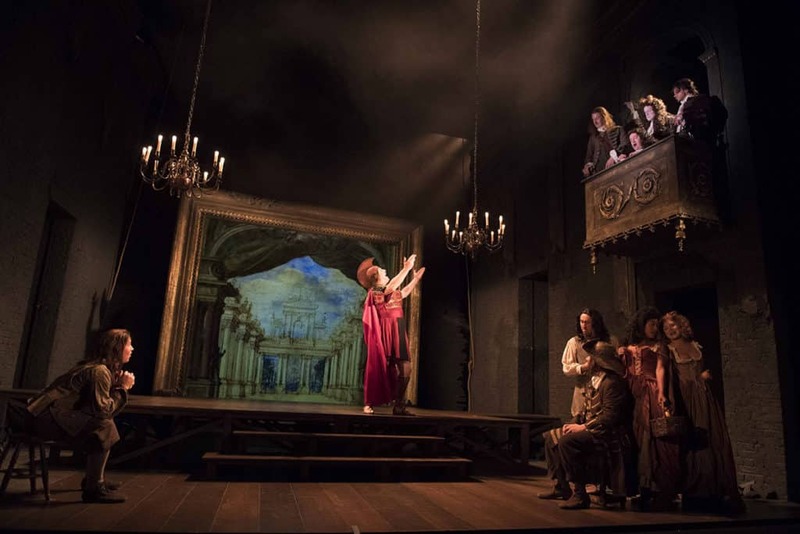 Lizzie Roper and Cornelius Booth delight with a series of eclectic cameos, Will Barton demonstrates sublime comic timing as Rochester’s deadpan and disengaged servant, and Jasper Britton is a marvellous Charles II. Britton and Cooper’s chemistry, coupled with Stephen Jeffreys’ finely judged dialogue, make this relationship both rewarding and realistic, and helps elevate an otherwise hurried conclusion. 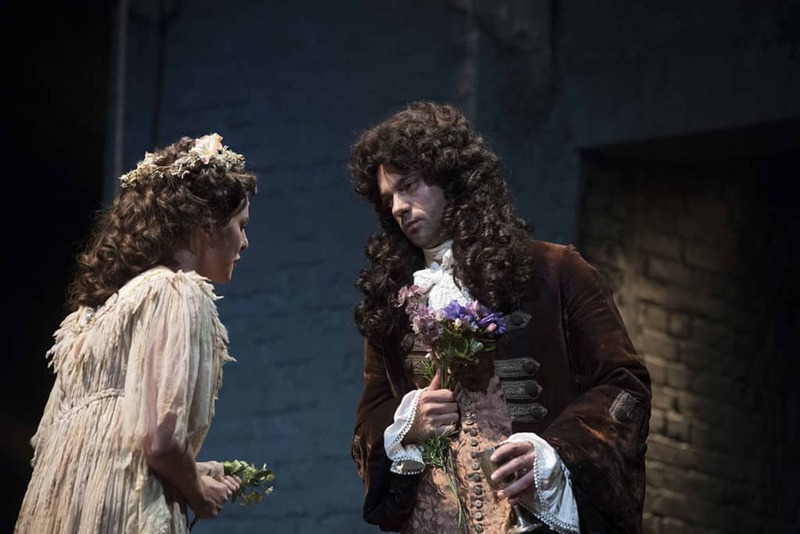 The Libertine is an enjoyable, but rather unfulfilling play. 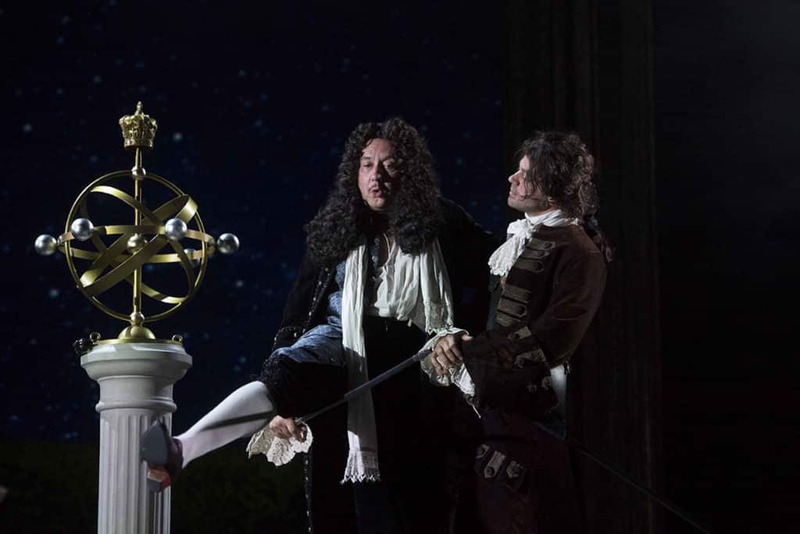 The Earl of Rochester is an intriguing figure, and Dominic Cooper’s is a witty and energetic portrayal. Yet in spite of the high calibre performances and tremendous dialogue – I lost count of the number of phrases I felt “I must look up” – The Libertine is a rather aimless piece. For all the philosophising and avarice, at its heart are two incongruously conventional romantic narratives. In spite of good performances by Ophelia Lovibond and Alice Bailey Johnson, these fail to draw complete conclusions about Rochester’s desire to love himself and others, and reconcile how such a passionate man could let his thirst for life slip away like so many empty carafes. 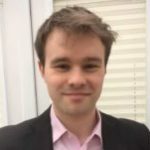 Matthew Lunn graduated with an MA in Romantic and Victorian Literary Studies in 2012, and has a particular interest in the writings of John Keats and Percy Bysshe Shelley. He has been with British Theatre since August 2015, and is still spellbound by all the wonderful theatre that London has to offer. By day, he works in the transport sector, and is a regular contributor to CHESS magazine.